Weight loss…it’s something the majority of us have struggled with at some point in our lives, if not our entire lives. Back to Health prides itself on keeping up with nutritional research and searching for the best nutritional products and professional companies to work with. For over four years, we have been coaching patients through some amazing weight loss, using homeopathic HCG. HCG is an amino acid found naturally in your body that stimulates use of your deep stored fat in times of very low calorie situations. We all have fat stores that our bodies won’t release with typical weight loss strategies, the Evolution protocols target that fat you never seem to be able to lose. We have upgraded our protocol to a more advanced system with 2 options for weight loss and supportive products to make it even easier and help even more patients. Evolution hA2cg, is a patent pending homeopathic version of HCG manufactured by Desbio with almost 3 years of intense research behind it. 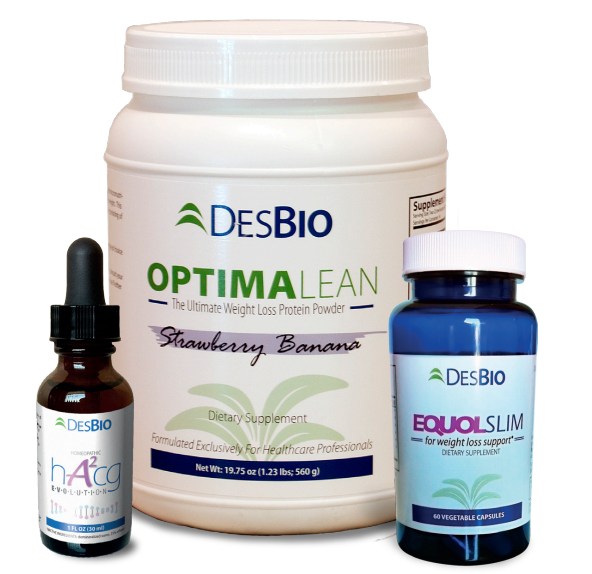 Desbio is a trusted medical homeopathic manufacturer that has been making homeopathic formulations for over 20 years. There is a 500 calorie version for those looking to lose 15-20 pounds or more and a 1000 calorie version for those that have less than 15 pounds to lose and those who wish to exercise in addition to the calorie restriction and hA2cg. We know that sounds very low in calories, but let the explanations below help you understand how it all works. Evolution is a revolutionary weight-management product designed to support medically supervised calorie restricted diets. HA2cg is bio-identical human amino acid chain groups that are highly effective at increasing your body’s ability to burn deep stored fat for fuel. While following one of the very low calorie diet options and using Evolution HA2cg, your body loses fat as it burns it for energy in place of the food you would normally eat. This way you can feel good on such a low calorie diet without the effects of being on such a diet too long. The formula also contains 21 other supportive homeopathic ingredients that target weight loss further and help you feel comfortable throughout the protocol. Weight loss with Evolution is mostly fat, while sparing muscle. It helps sculpt your body by losing fat in all the places you normally find it hard to lose. The diet protocol is based on research and testing from Dr. Simeon’s work from the 1950’s using injectable HCG. The Simeon’s “Pounds and Inches” protocol is not a quick weight loss gimmick. It works quickly with the initial weight loss, but requires time to reset your hypothalamus and work on permanent weight loss results, best monitored by a physician. Decades have gone by but the protocol remains largely the same except for the advances in the usage and delivery of the HCG. Dr. Kachele will spend time with you determining which option of the diet is best for you and how long you need to complete the phases of the protocol. She’ll help you understand how the diet works and some tips and tricks she has learned over the past few years of using the protocol herself and with patients in the office. You will receive a program booklet, supplies needed for the diet option you choose and one on one support by Dr. Kachele and the office through face to face, phone or email support. This diet is not intended for everyone. It is only as effective as the commitment you make to it. You will need to make the conscious effort to follow the protocol as closely as possible and change your habits to ensure the most success. There are certain medical conditions that may preclude you from utilizing this calorie restricted program. We also have available a complete detox protocol in addition to the diet that amplifies your weight loss results as well as give you a more complete detox. Utilizing the detox with the traditional protocols helps patients lose more weight, lose weight more consistently, help avoid plateaus and, help with possible side effects like headaches and fatigue. It also helps with elasticity of your skin and long term weight loss effectiveness. It is highly recommended to utilize the detox protocol and the weight loss protocol at the same time. Full support and supplies for a 20 or 40 day round of Simeon’s protocol utilizing Evolution hA2cg homeopathic formula.